I’ve been a supporter of Fairtrade Fortnight for many years now, from when I was an active Co-Operative member and helped out in store to my current position as a food blogger. This year the campaign is focusing on Sit Down for Breakfast, Stand Up for Farmers and runs from 29 February to 13 March. With this in mind, I’ve prepared a delicious Fairtrade Fortnight Breakfast using a number of Fairtrade products as well as baking a breakfast banana bread. Breakfast is probably the most important meal of the day, it’s certainly one of my favourites. It kickstarts your metabolism and nourishes your body, depending on what you eat, of course. We sat down to a rather indulgent but most delicious Fairtrade breakfast of cereal, banana bread spread with peanut butter and vegan hot chocolate topped with marshmallows. Sadly, many around the world are not so fortunate. In fact the very farmers who grow our food often go hungry along with their families – that can’t be right. The Fairtrade Foundation works with businesses, consumers and campaigners to secure a better deal for agricultural workers and small farmers. Over the next couple of weeks, they are asking you to eat a Fairtrade Fortnight breakfast to show your support. Luckily my local Co-op sells Fairtrade bananas, so they’re easy to get hold of; that’s a good start. Then I was sent a delightful array of other Fairtrade products to use for my Fairtrade Fortnight Breakfast, most of which were organic and some I’d not come across before. For over thirty years, Equal Exchange has been working with small farmer co-operatives around the world to produce high quality organic whole food products and to help improve the lives of local people by creating a fair and sustainable trade. Their unsalted smooth peanut butter is one of the best I’ve ever tasted. I’m now wondering why salt is ever needed. The cashew butter I haven’t yet tried but I most certainly will as it’s my most favourite nut butter of all. I also received their organic clear honey. Fragrant, floral and rather addictive, the honey comes from Mexico and Nicaragua. We go through quite a lot of cocoa powder, so I heartily approved of the large 250g tub of pure organic, vegan and gluten free Hispaniola cocoa. Incidentally, Equal Exchange offer a fabulous selection of organic fairly traded 100g chocolate bars. They sent me a bar of their lemon ginger dark chocolate with black pepper. Well I sort of knew I was going to like it and guess what? I did. With its fresh citrus notes and full bodied 55% cocoa solids, we were off to a good start; the presence of black pepper gave it a slight edge and enhanced the gingery heat. Traidcraft has been on my radar for many years. It campaigns tirelessly for trade justice and runs various development projects around the world as well as selling a number of Fairtrade products. My jar of Equal Exchange cashew butter, came via Traidcraft. As well as offering a wide range of food items, Traidcraft also sell homeware, clothing, jewellery, toys, gifts, cards and paper. I was sent a box of their Very Berry Geo Muesli and one of Geo Crunch. Granola is always a winner and this was a good one with plenty of fruit, almonds and seeds. The real surprise though was the muesli. It had an interesting mix of oat, barley and wheat flakes but also crisped rice, which gave it a lovely crunch. The cranberries, mulberries and blueberries made it a bit more unusual and also very delicious. We had a bit of both for our Fairtrade Fortnight Breakfast with some of our wonderful kefir. Based in Paisley, Scotland, JTS is a not-for-profit company importing and distributing fairly traded foods. For my Fairtrade Fortnight Breakfast, I received some MA’s tinned coconut milk. The coconut milk is thick and creamy and tastes gorgeous. I’ve had milk from some brands which is watery and tastes slightly odd. The coconut milk is currently being rebranded, so the picture above is what you should be looking out for in the shops, rather than the tins I was sent. MA’s ingredients are all sourced from small organic producers in Sri Lanka. Organic certification is also being sought, so although this isn’t on the label, it is organic to all intents and purposes. JTS also sent me some premium aromatic Kilombero rice, a 500g packet of brown and the same of white. The rice is grown by small producers in Malawi using traditional cultivation methods that protects the rich alluvial soils. I haven’t’ tried any of it yet, but there’s a rather tasty sounding recipe for a vegan rice pudding on the coconut milk label using this rice, coconut milk and spices. I’d not come across Bonny Confectionary before. Based in North Wales, they specialise in handmade gourmet marshmallows, which look and sound rather wonderful. Whilst they are gluten free, they contain gelatine so are sadly not suitable for vegetarians and vegans. Whilst I never buy marshmallows, I find them hard to resist, so I tend to cave in on the odd occasions they are presented to me – shh, don’t tell! 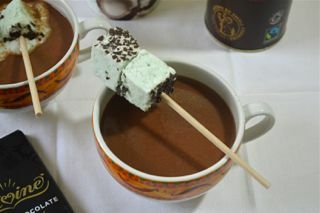 I like the concept of their marshmallow dippers on a stick for dunking in hot chocolate or the hot drink of your choice. The spearmint and chocolate marshmallow melts I was sent, sweetened our drink and gave a subtle minty freshness to it, which was far nicer than I was expecting. Divine chocolate is pretty much what you’d expect from the name. It’s been selling fairly traded chocolate since 1997 and was the first company to be part owned by the cocoa producers themselves. You can find more about the organisation and what it offers by going to my post Divine intervention or to the Divine website. I was expecting a delivery for my Fairtrade Fortnight Breakfast, but it didn’t make it in time. Luckily, I had a bar of their 85% dark chocolate already to hand, so I was still able to use it in my hot chocolate recipe. The dark chocolate with almonds & raisins is a new bar just out. Made with 60% cocoa solids from the Kuapa Kokoo co-operative in Ghana, it has Divine’s signature adrinkas both on the wrapping and the bar itself. The almonds are grown in Pakistan, the sugar comes from Malawi and the vanilla from Madagascar. All ingredients are, of course, Fairtrade. I may not have had the time to have any for my breakfast, but I did manage to try a square or two before going to press. The crunchy nuts and sweet burst of raisins, makes it quite delicious. I’ve not come across the Caramel dark chocolate bar before, so I’m definitely looking forward to trying that. Speaking of chocolate, Seed & Bean also have a fabulous range of organic Fairtrade bars. I think I may have tried most of them, but then they threw the Pumpkin Seed and Hemp into the ring. This 72% dark chocolate bar studded with pumpkin seeds and flavoured with hemp oil lives up to the high standard I’ve come to expect from Seed and Bean. Like all of their bars I’ve tried, the chocolate is really smooth and despite the high cocoa content, not at all bitter. The seeds give a welcome crunch and nutty flavour and the hemp oil, whilst hard to describe, is definitely present. CT thought he could detect whisky undertones and I sort of understood what he meant – robust and slightly peaty. We both really liked the bar, as demonstrated by the speed in which it disappeared. So to my banana bread. I was initially inspired by the picture of Danni’s banana bread from her recent book Hungry Healthy Happy; it’s spread with peanut butter, a seductive idea. I decided to create a barely sweet, dairy free and less cakey version of this classic bake. Something that could be easily sliced, toasted and eaten for breakfast and most importantly slathered with peanut butter, specifically, the Fairtrade organic peanut butter from Equal Exchange. I made mine with four bananas, sprouted spelt flour and some of Equal Exchange’s fragrant floral honey. We had it toasted and untoasted. Both were thoroughly delicious, especially when spread with the peanut butter. For my hot chocolate recipe, I wanted to create a luxury dairy free drink that was suitable for vegans. A tin of MA’s coconut milk seemed just the ticket. Divine’s dark chocolate and the cocoa from Equal Exchange added a rich chocolate tone that tempered the coconut flavour nicely. As we were dipping the marshmallow melts in our chocolate (vegans beware), I didn’t add any additional sweetener. A spoon or two of maple syrup would otherwise have been added and I have included that in the recipe. The hot chocolate was such a treat – rich, creamy and totally indulgent. A quick and easy to make banana bread, that's full of nutritious ingredients. It's not too sweet, so is ideal to eat at breakfast and is particularly good spread with peanut butter. Also good toasted the day after baking. peanut butter to serve (I used organic fair-trade unsalted smooth peanut butter from Equal Exchange). Peel and mash the bananas in a large bowl with a fork or potato masher. Beat in the honey, oil and egg until everything is more or less smooth. Sift in the dry ingredients and fold in carefully to avoid any lumps. Pour into a 2lb oiled loaf tin (I use a silicone one) and bake on the middle shelf at 180℃ for 45 minutes or until the loaf is well risen, golden and has a nice crack along the top. Leave in the tin to cool for 5 minutes, then turn out onto a wire rack to cool completely. Thick, rich and dairy free, this hot chocolate is a high treat for vegans and non-vegans alike. Best saved for special occasions only. Scrape the coconut milk into a small pan and place over a gentle heat. Add the chocolate and maple syrup and leave for a minute, then stir. Rinse out the coconut milk can with hot water and pour into the pan. Bring to a near simmer, whisking occasionally. Test for sweetness, then pour into mugs and sip with relish. Makes 2 x 250ml cups, but as it's very rich it could easily make 4 x 125ml cups. Thanks to all those mentioned who sent ingredients to help create a Fairtrade Fortnight Breakfast. This is not a sponsored post. All opinions are, as always, my own. My pleasure Camilla. It was an unusually good breakfast. I’ve now got rather addicted to having a slice or two of banana bread toasted and spread with peanut butter. Those Extra Dark Chocolate Bars sound divine!! As does your vegan hot chocolate. It looks seriously rich and luscious! And who does’t love banana bread – so good! Thank you so much for linking up to mine as well! If you hear the words ethical in association with chocolate, it usually means good quality in my experience Jenn. Haha, thanks Sarah. I think I spoilt us, we don’t usually have such indulgent breakfasts. Divine’s packaging is fabulous and the chocolate has the adrinkas on it too. I also like the Seed and Bean packing which is bright and cheerful. I didn’t know it was Fairtrade Fortnight, thanks for the info! I always buy fair trade when I can, it’s so important. Your banana bread sounds just yummy. Thanks Becca. I think many people would want to buy Fairtrade products if they understood the issues. Thanks Emma. Yes, it’s hard to always bear these things in mind when shopping and trying to keep the cost down. The quality of these Fairtrade products is pretty high, so it’s a win win really. I like the sound of the vegan hot chocolate a lot! I had no idea it was Fairtrade Fortnight , I always buy fairtrade bananas and am mindful of any other products that I can buy to support fairtrade. It makes me really sad when I think of poor farmers and their families who labour hard to provide t a society that so often manages to ignore them. Thanks Manjiri. It’s very hard to forget this sort of poverty when we are all wrapped up with trying to live our daily lives. It’s good to get a reminder from time to time. Wow that is so sad to think of farmers growing food for others and then going hungry – how wrong is the way our world works! Great post. I am very particular about peanut butter and only buy one that is 100% peanuts (it is best from a health food shop fresh – you should try some in your froothie blender!) I love the thought of banana bread with peanut butter for breakfast. And such a lovely banana bread. Thanks for sharing one of my links. Yes, we live in a very unequal world Johanna and I find it terrible that in this day and age with all our knowledge, technology and wealth that it is still so bad. Yes, nut butter is one of the things I keep meaning to try and I really really must. I remember when I was a young, my mother used to get our peanut butter freshly ground from the health food shop – can’t do it any more so things seem to have regressed. What a collection! I have never thought of spreading peanut butter on banana bread before, must give it a try. Learn something new everyday. The banana bread looks delicious. Very informative, thank you! I’ve never tried peanut butter on banana bread but now…. I’m a huge fan of Divine Chocolate! Sounds like a great campaign! Your banana bread looks great — I’ve never baked using sprouted spelt, so new to me! Thanks Patricia. This was the first time I’ve used sprouted spelt too. Banana bread, with peanut butter spread and hot chocolate aaaah all my favorite foods and drinks, however, I’ve never tried peanut butter on bread. I have to remember that next time. I wonder how it would taste. Everything sounds divine! Thanks April. If you like sweet and savoury together, you’ll like the peanut butter on banana bread – it’s just got to be tried. Lovely banana bread! And I agree that it is so important to choose fairtrade whenever possible. Your selection of fairtrade products shows just how easy it is to make the switch. Thanks Kate. I think awareness is half the problem, but more and more people are getting to understand the issues and hopefully making the switch. Fairtrade is a hugely important principle and we should all support it whenever we can…. There are some amazing products out there and some fab ones you have show-cased here!